Eneclann and Ancestor Network have assembled probably the largest ever team of Irish genealogists with a huge range of expertise, including our own Fiona Fitzsimons and Carmel Gilbride; Brian Mitchell (author of the Irish Genealogical Atlas; Guide to Irish Church Records); renowned Irish-American genealogist Eileen O’Duill; and the research team behind the Genealogy Roadshow – Aiden Feerick, Hilary McDonagh and John Hamrock, to name a few. This crack genealogy team will be a wonderful resource for overseas visitors and the home audience alike, and a good news story in the year of the Gathering. This is the second year that the Eneclann-Ancestor Network partnership has brought you the NLI’s Genealogy Advisory Service, this year operating on extended hours to give you even more opportunity to research your family tree. Much kudos to the National Library of Ireland for securing the team that brought you President Obama’s and Tom Cruise’s Irish family history. 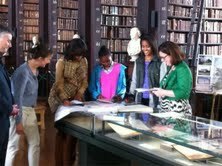 Eneclann’s Fiona and Helen got to meet Michelle Obama and her two daughters, Malia and Sasha, in the Long Room in Trinity College’s library when they were visiting Dublin on Monday 17th June and tell them all about their Irish family history. Fiona said of the event ‘It was very exciting to meet Michelle Obama and her two daughters. It’s a real privilege to be given the position of trust, to present the first family with the narrative of their Irish family history. They listened intently, and were interested and amused by the stories of their Irish ancestry.’ You can read more about Monday’s event or view some images on our Facebook page. Make sure that you take a look at the research already completed on President Obama’s Irish family history while you’re at it to get the full story! 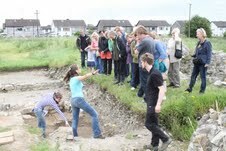 Ancestral Connections: names, places and spaces is a University College Cork genealogy summer school offering a complete course in the latest Irish genealogy research. All aspects of the subject are covered by a series of presentations and ‘hands on’ workshops given by a selection of Ireland’s leading genealogical lecturers and experts, including Eneclann’s Brian and Fiona. Power, Prayer and Public Archaeology Conference is being organised by the Irish Archaeology Field School (IAFS) and Meath Heritage Office, in association with the Heritage Council and the Gathering Ireland, in celebration of 750 years since the foundation of the Black Friary in Trim, Co. Meath. Also historical in nature is the Aughrim Military History Summer School, this year focussing on west of Ireland battles. On Saturday 13th July John Cronin and Damian Shiels will be talking about the Battle of Knockdoe, examined as part of the Irish Battlefields Project that Eneclann researched. 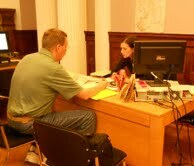 We are holding a genealogy roadshow as part of this year’s Swift Satire Festival in Trim Castle Hotel, Trim, Co. Meath. The whole weekend of the Swift Satire Festival is shaping up to be as fantastic as last year. There’s a comedy festival, ‘Satire Circus’ and ‘The Gulliver Gathering’ with all 302 pages of Gulliver’s Travels read by 302 people! Until Friday 5th July 2013 you can get 50% off this newsletter’s Topic Focus titles – on Judges, Law, the Police and the Courts! Please be aware though that the half price discount does not include the RIC Collection, since this is already on more than 50% reduction. This topic includes our hugely popular Royal Irish Constabulary titles. 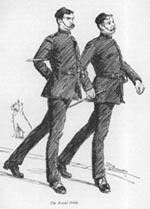 Such as: the RIC Manual for 1909, the RIC List and Directory for the years 1889, 1910, 1915 and 1920 and Curtis’s The History of the Royal Irish Constabulary (1871).